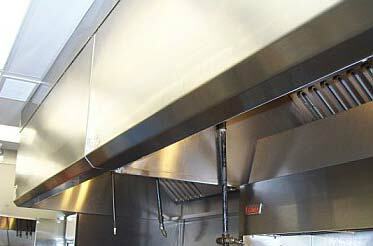 Our exhaust canopies are available in depths ranging from 42" to 72" and are sized to the equipment beneath. For instance, when woks are present we will size the hood deeper to gain better capture due to the fact that woks create a lot of smoke mixed with steam. Kitchen Stainless Hoods' most popular exhaust hood offers a system that is efficient, economic and most importantly inexpensive. We will design the system according to YOUR needs. There is no such thing as a "one size fits all hood." © Copyright 2019 Kitchen Stainless Hoods. All rights reserved.